Marc Venables, a Court Leet Officer, has for the second year, arranged a Zombie Pub Crawl to raise funds for the Alcester Cafe. Last year he raised £50 and this year the figure is around £200. Well done to all those taking part! Once again, Rotary Club Alcester Alauna are supporting Alcester Cafe and other charities. 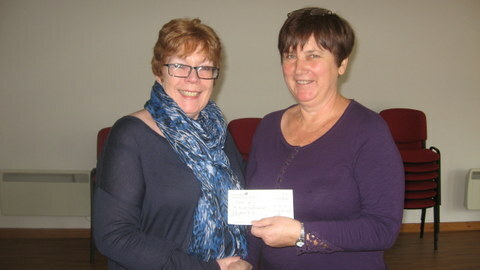 At the tree of light £1000 was donated towards help in setting up a dementia centre. £5000 was presented to Alcester Cafe from a local charity, “The Alcester Wednesday Night Over 70’s Fund”, which has now closed its doors. The charity provided fuel (coal, firewood etc) for local people in winter. The trustees of this charity, Mr Pick and Mr Harris, wanted the money to be used locally so decided Alcester Cafe suited their bill! Mr & Mrs Pick above presented the cheque to Carole. Much fun was had by all who attended the Startled Ferrets evening at Haselor. £730 was raised for Alcester Cafe. Social Outing – Wednesday 2nd July Gaydon Motor Museum Coach Trip. A group of people from the Alcester cafe, together with family and friends, had a super day at the Gaydon motor Museum. Thanks to John & Sylvia Fenlon for organising the coach and the day out. Fundraising – Wednesday 18th June Fashion Show at Welford Village Hall. Nearly £1,000 was raised for Alcester Cafe by the Fashion Show at Welford-on-Avon. Our thanks go to Sue & Norman, Gill & Simon who did such splendid work organising tickets, hall, decorating the room and generally looking after everyone. Our thanks also go to “The Wardrobe” at Welford-on-Avon who provided the clothes and models. Thanks also to John, Sylvia, Sally, Eileen and Roger who helped on the night. Alcester Cafe is the charity for the year, suggested by Ladies Captain Kathy Cowell who is a volunteer at the Alcester Cafe. Above Carole Zambonini talking to the players about the work of Alcester Cafe. Alcester Library and Medical centre both have information available all week. 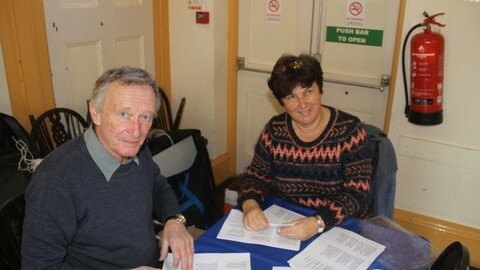 Carole and Roger Zambonini getting organised for Dementia awareness week. Awareness Dementia Friends Session, Wednesday 21st 10-11am, Library. Awareness Coffee morning ,Alcester Town Hall, Saturday 24th 10am-12 noon. Alcester Cafe are being presented with £1,000 from Alcester Rotary Club Alauna “Big Breakfast”.